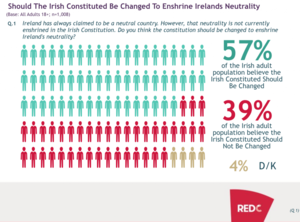 Independent TDs Mick Wallace and Clare Daly released the results of a Red C poll earlier today, which show over half the population don’t agree with Ireland’s current military relationship with the United States – which uses Shannon Airport to refuel. 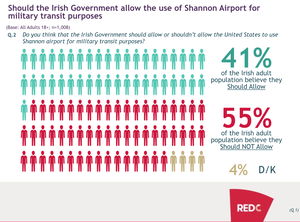 Some 55% of those polled say they don’t believe that the Irish Government should allow the US to use the Limerick airport for military purposes. 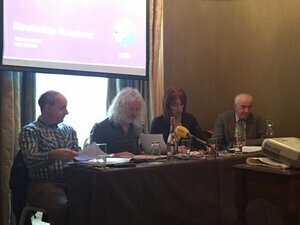 Mr Wallace and Ms Daly held a press conference earlier today with Dr John Lannon and Ed Horgan, of Shannonwatch, at the Buswells Hotel, Dublin, to discuss the poll’s results. “Until we enshrine a policy of neutrality in our Constitution, and make it so that our neutrality is something that is real, positive, and active, we cannot and will not play that role”. “Since 2001, the US Military and their allies have been responsible for the deaths of over 2 million citizens in Afghanistan and Iraq alone. Mindless destruction of the Middle East region & beyond has seen the displacement of over 30 million people and an unprecedented refugee crisis in Europe today. “In addition US military aircraft have transported unknown quantities of munitions and other war materials through Shannon airport but the Irish Government has been repeatedly denying that these aircraft are carrying weapons and munitions. Irish neutrality needs to be urgently restored to prevent Irish complicity in crimes against humanity”. 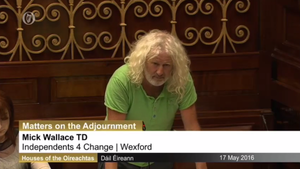 Posted in Misc and tagged Clare Daly, Mick Wallace, Shannon at 7:13 pm on March 15, 2016 by Broadsheet. jasus would all these smartypants’ please think of de poor oul Duty Free at Shannon??? if all dem soldiers weren’t there anymore what then, eh? What do the 57% think we should do if attacked? Hand the aggressors a copy of the Constitution? Pathetic. Yeah, because in our current situation we’ve got so much safety. We’ve basically been a convenient landing area for whatever superpower decided to take over for the last 70 years, and we were a convenient port for the British empire for the few hundred tears since. I’d prefer to take my chances and at least retain some national pride, than just roll over for a few bob. I’m not entirely sure how writing into our constitution that we have no intention of ever fighting for anything we might believe in would do anything for what remains of our national pride. You’re free to emigrate and sign up for any war at any time. The national security of this country is already at risk thanks to our disregard for international law and supporting the US in it’s crimes against humanity. I’m not sure you understand what neutrality actually means. It’s possible to be non-aligned or militarily neutral without being passive (I don’t mean pacifist). We have for many years fought around the globe for things that we believed in, via UN-mandated missions to enforce and keep peace. That seems like the kind of thing that is going to bring a lot more respect from people around the world, rather than dancing to the tune of a bigger more militaristic nation. What’s pathetic is your contribution to the debate. It’s about the resisting being used a pawn in imperialist war games and not “writing into our constitution that we have no intention of ever fighting for anything we might believe in” as you put it. That’s just silly. I think that’s what they call a “straw man” argument. Why does allowing Irish citizens to have a greater say in deciding whether to align ourselves with the imperialistic aspirations of other nations necessitate a massive increase in Irish military spending? My interest is in protecting the constitution from partisan abuse with God knows what consequences in the future. “Pawns of imperialist warmongers” figure prominently in student union debates where I’m sure you can continue to work yourself into a froth over them. F_lawless because making yourself neutral is not just about words in a constitution. You will require the ability to protect your airspace and shipping lanes in the event of a conflict breaking out. The Americans and British did it for us in WW1 and WW2. “fighting for anything we might believe in”,like God maybe.That’s a good reason to kill somebody. as it stands I would be happy to be part of a country with a neutral policy but I wouldn’t want it enshrined as you don’t know what’s around the corner. Ah John Lannon, what a team he made with Paul MacCourtney. Shoddy job. Hiring a proofreader is one soluted. Boom! I like your work. Amazed it took so long in the comments to get around to this. Nice contributed. Behind the speeches of those four is a deep and abiding hatred of Israel, whom they believe is the ” root cause ” of all troubles in the ME. And if they could only be defeated and scattered to the four winds – again – the Arabs would revert to their default position of peaceful coexistence. Got it in one. Spot on. Their call to have our neutrality enshrined in the Constitution is motivated by a deep and abiding hatred of Israel? I can’t see any reference to Israel in the above.. says more about your own disturbed mindset…. unless, you have some references to back all that up?! Are you saying he hasn’t exercised Jew diligence? Very good – mazel tov! Shannon is in County Clare, not Limerick. 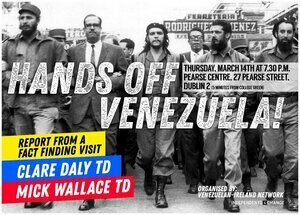 Is Wallace in Clare too occasionally? He better not be caught in Shannon again! Where – on the landing strip? But Shannon Airport always had a Limerick address. Ah, you missed the memo – “constituted” is a noun now because some tax dodger says so. Please try to keep up wit de nu verbidge. I would vote against an attempt to enshrine neutrality in the constitution, even though I’m generally in favour of it in principle. It unnecessarily ties the hands of a govt in the future from even bluffing. 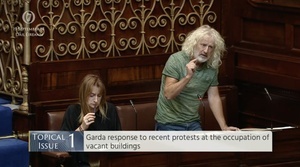 I know there’s scepticism about politicians at the moment but the answer is to elect less bullsh!t TDs (including Wallace, Lowry, Kenny, FF) instead of trying to enshrine all your current favoured policies into the constitution. I Agree, they may need to invade the north after Brexit when Britain imposes border controls on their island. Bluffing? explain in the context of Ireland how that might come about. After Brexit, one of two things happen. Border controls are placed on the border of UK and ROI or border controls are placed around the Island of Britain, Theresa Villiers has already stated that there will be no border controls between ROI and NI. In that case, the north’s position within the UK will become weakened and civil unrest will become almost a certainty. Add to that the fact that Scotland will demand independence therefore the breakup of the UK becomes inevitable and you are into a very volatile situation in NI. I don’t know how it would come about but that’s exactly the point. You can’t predict all plausible future scenarios in advance. It’s weird. I see the results of polls (sometimes several different polls) every day & I have never once been in the sample. How do they dig them up? Have you ever considered that the fact it seems weird to you could be a sign of narcissistic tendencies – as in, an over inflated sense of self importance? Just a thought. Not really. Statistically, it’s odd that I never have. I said it to a couple in work & almost all of them had never been polled. I’ve been polled at least once, while still living with my parents. They rang the home phone, asked my mum a few questions, then asked if there was a teenager in the house who’d be willing to be polled and I said yes. Bear in mind that most polls tend to ask between 1,000 and 2,000 people for responses, as apparently once you get to that number of answers it scales up accurately. So the odds of being polled are around 2% per poll comissioned. Brilliant. It’s like the end of a modernised Ulysses. Face it, they just don’t like you. The notion of Irish neutrality has long been a nonsense. Happy to claim all of the rights, but none of the responsibility. How much are we payed each year for the use of Shannon by the yanks, and if they stop the planes landing will it have negative influences on any business in Ireland (other then direct financial loss from the planes landing)? Answer that before you ask if people want them landing. Personally I don’t want them landing, but lets get a clear picture.